There are 13 reviews of Rush 2. All I can say about Gucci Rush II is : It's stunning. It's my daily perfume. It's unoffensive. It's a little mysterious. People ALWAYS ask what perfume I'm using as they think I smell delicious :) Always find it's a compliment when people you don't even know from Adam, want to know what perfume you use. a refreshing,cute, elegant perfume for warm spring and summer days. Very unique and discrete, has a quality into it! i wouldn't caracterise it floral but i found it to be woody and crisp! 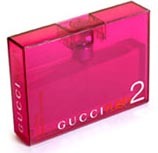 Although it is a light scent it is sofisticated enough and suitable for all ages and types of women. The only negative thing is that the lasting power is poor, you have to reapply after 1 hour or so. Rush 2 is hardly related to Rush at all. This is an entirely different composition altogether. Upon first application, I could barely smell it. The opening notes are extremely subtle and intimate. I would describe the rose, freesia and lily of the valley as having a soapy and fresh-like quality. With the emergence of the heart, Rush 2 develops character. The scent strengthens considerably and shows elements of originality. The soapiness is still present, however I detect a subtle greeness, like a tropical, damp garden smell. Rush 2 concludes with a simplistic black currant and musk blend, with this being the only fruity kick you will experience during the development of Rush 2, right at the very end. I vividly remember a man that owned a perfume store where I used to live, raving on about Rush 2. He had me try it several times but I had to go back to this fragrance 3 years on because the scent hadn't stuck in my memory. Because of that I don't think this fragrance is very memorable, certainly not signature material in my humble opinion. i LOVE IT it is quite like White Linen with a sharp kick...if you love a summery scent that has staying power, I totally recommend it. This, along with Marc Jacobs, is my quick-spritz-dash-out-of-the-door perfume - it is fresh, clean, inoffensive, neutral, from start to finish. It is a slightly ozone-y green floral, with hardly any middle or basenotes to speak of. After about 15 minutes, it is barely discernible, and quite forgettable. It is however a very pleasant and neutral, almost unisex perfume, and as it is so uncomplicated and easy to use, it goes fast. the sexed up version of baby doll in my opinion.